Over the last couple of weeks, I've noticed my budgie does this weird little shuffle thing on his perch. He sits there, and every now and then, just sort of runs on the spot for a few seconds. Sort of very quickly picks up one foot, puts it down, then the other and so on. i see him stretching his legs fairly oftn and occasionally nibbling at the back of his leg, as though he has an itch, but i don't really think its often enough for it to be something nasty worng with him. I'm just wondering if you guys have any ideas as to what makes him do it? I have been gradually trying to tame him (he's a shy little bugger), just by holding a millet spray in my aind in his cage and letting him nbble on it at htis stage, so we haven't really advanced to anything too scary. generally he's happy to come to the edge of his cage and give me a kiss on the nose, we just need to work on finger-taming. I'm worried that maybe he's developed a strange nervous habit, or that he's feeling stressed out or something... i don't want to create a neurotic budgie! Do you give him his flight time each day a round the house. 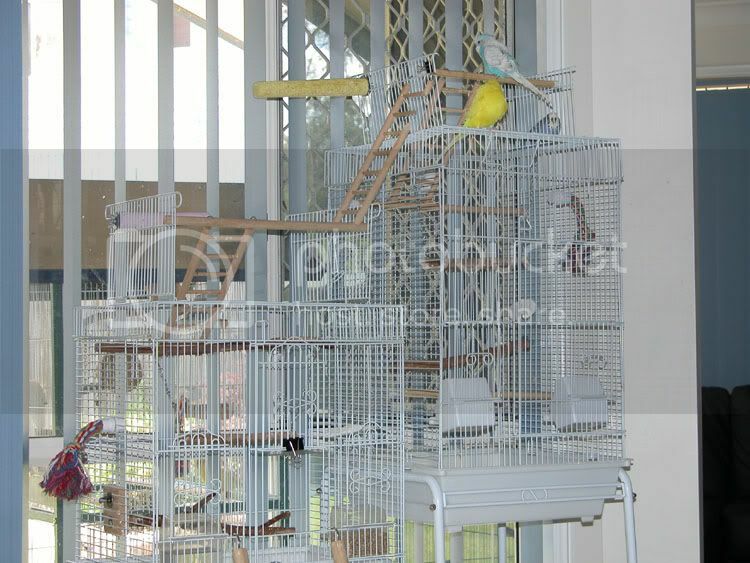 My indoor Budgies, George, Angel and Chirpy are never locked in their cage. They are free to roam the house. Here is their Cages ... always open on the top. also have you checked the bottom of his feet to make sure there are no sores, or anything that could be bothering him? Also when he does this with his feet does he do anything else? Like head bobbing, more singing? I do mak sure he gets his exercise, though he's not particularly tame yet,so i am a bit wary of letting him out around the house. I usually just shut the door to the study and let him fly around in there for a while. His cage is pretty big too, and i make sure the branches are far enough apart that he has to flap a bit to get from one to the next rather than just hopping. So hopefully, he's getting enough exercise. I will get him checked out at the vet to make sure his feet are okay.